Bushy, vining 24" plants are clustered with luminous flowers. We are astonished by ‘Summer Gown’s out of this world color: a rich, deep burgundy-purple that gets still bluer over summer. Bushy, vining 24" plants are clustered with luminous flowers complemented by deep-green ivy leaf foliage. The rambling plants send out runners tumbling from baskets and containers. Edible flowers. 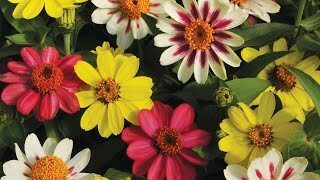 Adds radiance to borders in sun or shade. Nasturtium, Summer Gown is rated 2.0 out of 5 by 4. Rated 2 out of 5 by love vintage roses from was not this color so excited to get a pink purple or blue nasty—- but these turned out to be orange! Rated 3 out of 5 by Indie from Not quite that color The color of my flowers were a little different from the advertised picture. I had a mix of burgundy and faded pink flowers. Some were brighter than others, but none quite like that bright pink. Pretty, but not what I was hoping for. Rated 2 out of 5 by Sarah921 from Disappointing These seeds grew just fine, but the flowers are few and far between. They're all small and shriveled looking, with very little color. I wanted a pink Nasturtium, but i ended up with virtually no flowers. Should have settled for red and orange.